Specimen kindly loaned by Dr.Martin Luff Widely distributed throughout the British Isles to the far north of Scotland including the Western Isles, Orkney, Shetland, Anglesey, Man and even Lundy (Luff, 1998) and quoted by Luff (2007)as abundant. Most inland records are from the north of England above Derbyshire to the borders, further south there is a coastal tendency but important from our point of view is the lack of records for some considerable area around south Herts. Typical habitat is open, dry grassland, heaths and moors and so it is not inconceivable that the species should occur locally eg the easten part of Common moor and surrounding grassland. Furthermore the adults are active from March to August (Luff, 2007) and are autumn breeders (following diapause? ), which coincides with periods of intense activity from local coleopterists so we expect eventually, if the species is present, to find them. 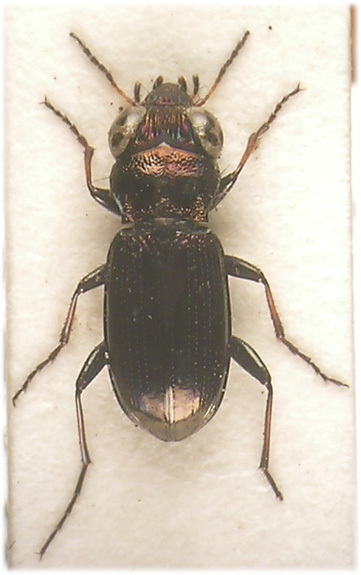 It should be added that, as a matter of routine, all Notiophilus without pale apical markings are taken for examination but so far (September, 2008) the species has not been found. The search continues. 4.5-5.5mm. Upper surface black with strong metallic lustre, bronze or coppery, sometimes blue, most pronounced on head, least so on elytral disc. 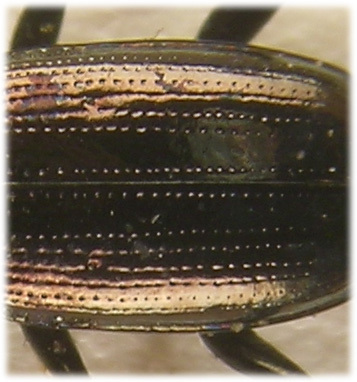 Elytral apices without paler marks but may be obscurely rufinistic (Lindroth, 1974). Head as broad as pronotum, with a single seta beside eyes, frons with six parallel ridges, the lateral ones extending back further, with a wide and deep furrow either side containing two strong punctures. Base strongly microgranulate and dull, obscurely and mostly punctured towards hind margin of eyes leaving a wide unpunctured area (cf.N.palustris). Clypeus shining with longitudinal furrows and two long setae towards base, labrum dull metallic and strongly microgranulate. Antennae dark with segments 1-4 pale, 1 obscurely darkened dorsally and 4 towards apex. Pronotum evenly rounded and strongly contracted towards base, anterolateral declivity steep otherwise rather flat dorsally, strongly punctured around margins and microsculptured laterally. Hind angles sharp and slightly acute. Mesoscutellum dull, with strong isodiametric microsculpture, metallic and almost smooth towards apex. 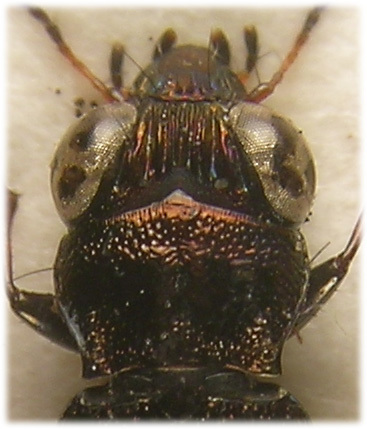 Elytra broadest at, or somewhat behind, middle, strongly bordered basally and laterally, second interstice as wide as or a little wider than 3 and 4 combined, 1-4 glabrous and shining, outer interstices less shining due to fine microsculpture which is strong and more extensive apically. With two strong subapical punctures and a single foveate puncture in the fourth interstice before the middle (at least in this species). Femora dark, metallic. Tibiae and base of tarsi rufous.